This post is going to introduce how to resize ext4, ext3 and ext2 Linux partition without losing data on Windows 10/8/7/XP so that you can extend, shrink, split and resize Linux ext4 partition on Windows easily. Resizing partition is a common operation to many computer users, for in many cases, partition size is not appropriate. For example, system partition is running out space and we can extend it without losing data, which saves us from repartitioning hard drive and reinstalling operating system. Windows disk management console provide basic disk resizing function, but it does not support resizing Linux partitions. Linux is one of the most popular operating systems, which is preferred by computer geeks and experts who usually dual boot their computer. Ext4 partitions can be read and written under Windows with the help of third part partition manager. In some occasions, you may want to resize ext4, ext3 or ext2 Linux partitions in order to configure them to the most appropriate status. As we all know, we can resize ext4 partition using GParted under Linux environment. However, do you know how to resize ext4 partition on Windows? The following part will present steps to resizing an ext4 partition on Windows. In this guide, we’ll resize ext4 / ext3/ ext2 Linux partition with the help of DiskGenius under Windows and the resizing process does not cause data loss. DiskGenius is free Windows 10 partition manager software, it contains various features to manage disk and partitions, such as create, format, hide, clone, backup, delete, extend, split and resize partitions. Besides, it is able to recover deleted files and lost partition, check & repair bad sectors, image disk, clone hard drive, edit hex data, check S.M.A.R.T. information, backup system, check partition table errors, manage virtual disk, etc. This Windows partition manager support multiple file system formats, including NTFS, exFAT, FAT32, FAT16, FAT12, EXT2, EXT3 and EXT4. Step 1: Connect the hard drive that contains the ext4 partition you want to resize to a Windows computer. Step 2: Download, install and launch Eassos PartitionGuru from your computer. Then you can view the partition to be resized. 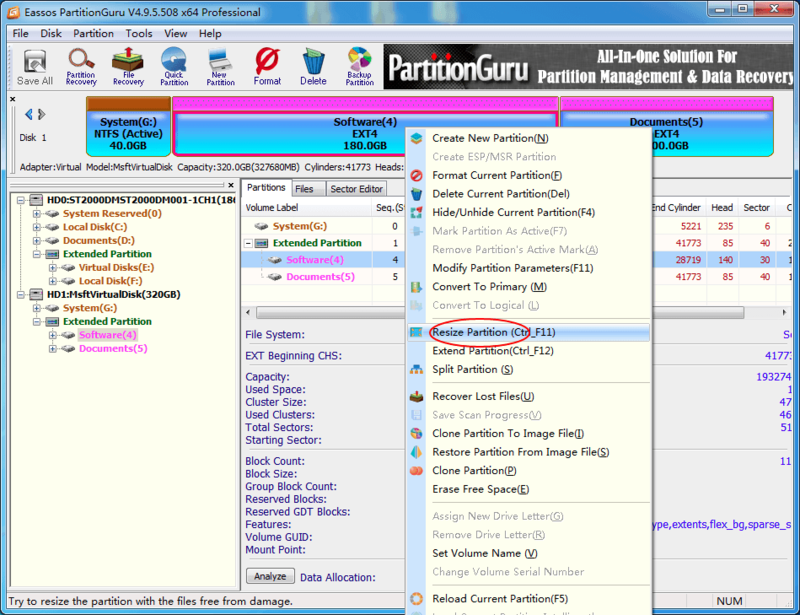 Step 4: Set partition size you want to move between partitions. You can drag the arrow between partitions or enter the exact size in the column below. Step 5: Click “Start” button and PartitionGuru will prompt the rest operations to be done. Click OK to continue. Step 6: Wait for a while and the resizing process completes. How to read EXT4 partition on Windows 10? How to write ext4 on Windows? How to create ext4 partition on Windows 10? How to format ext4/3/2 on Windows 10? This entry was posted in Partition Manager and tagged ext4 windows 10, resize ext4, resize ext4 partition, resize linux partition, windows 10 partition manager by EASSOS. Bookmark the permalink.